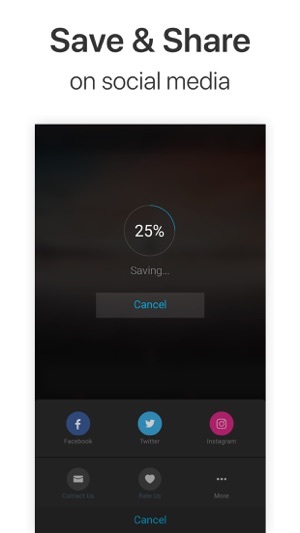 - IMAGE SUPPORT: Now you can add image to make slide show video. Make an awesome video combining videos & images. 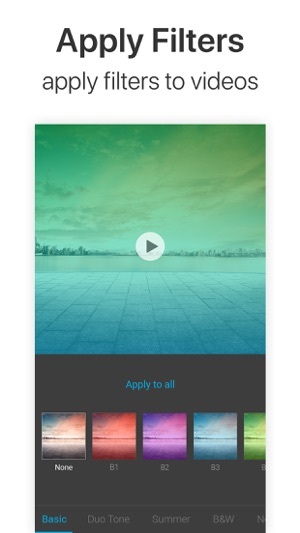 - FILTERS: Give a new look to the videos or photos with beautiful filters. - THEMES: Select from the custom themes. - MUSIC: Browse our 1000+ collection of music and choose from different categories. 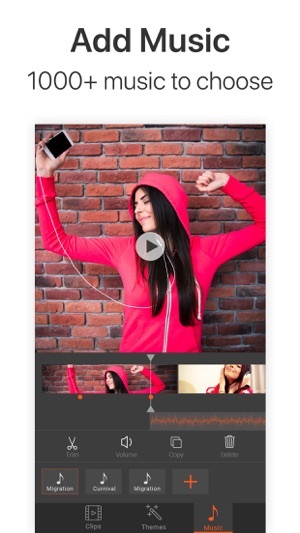 - TRIM: Trim video clips precisely. 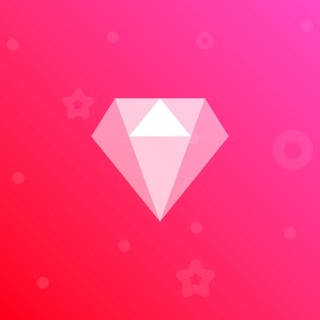 - TRANSITIONS: Apply transitions between videos. - SPLIT: New split tool is to divide videos into multiple clips. - RESIZE/CROP: Resize & Crop videos easily! 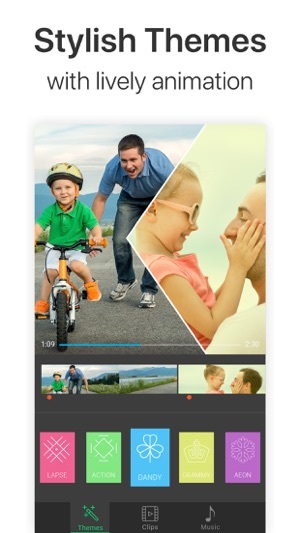 - FLIP HORIZONTAL/VERTICAL: Flip videos or photos horizontally or vertically. - Full HD Output: Now support for full 1080p video output. 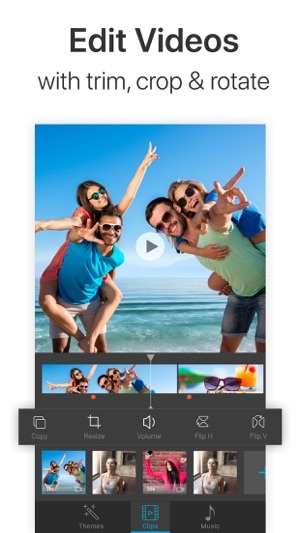 - VIDEO ORIENTATION: Set video orientation to Landscape, Portrait and Square. - SHARE: Share videos to social media like Facebook, Instagram & Vine! -> Payment will be charged to iTunes Account at confirmation of purchase. -> Subscription automatically renews unless auto-renew is turned off at least 24-hours before the end of the current period. -> Account will be charged for renewal within 24-hours prior to the end of the current period, and identify the cost of the renewal. -> Subscriptions may be managed by the user and auto-renewal may be turned off by going to the user's Account Settings after purchase. -> Any unused portion of a free trial period, if offered, will be forfeited when the user purchases a subscription to that publication, where applicable. So i open the app and am greeted with 4 adds that i click out of. Then this “music” starts playing which sounds like a turkey on a out of sync drum machine. Of which you are unable to turn off and literally took a whole minute to kill me and i muted my phone. So i took it in stride to see whats the app and the reason i downloaded was to combine videos for free.. well i go to start and every vid i click the buy full version add keeps popping up no matter what. So cant combine vids, adding music is extra, cant add filters and have an annoying headache of a glitched out “song” that never stops.. waste of my mbps.. no go trust me, not this one.. rather be on the maury povich show with 3 wives than waste another second fooling with this foolishness..
Hi, Sorry for the problem. Please contact our support email which is "info.kitegames@gmail.com" Or you can also email us through our app from "Contact us option. Experts are there for you to give you any kind of assistance regarding our apps. I just tried for the third time, to save a video that took me over 30 minutes to put together. And for the third time the app quit and didn’t save anything! All my work was lost. This app is made to put video clips together, why is it breaking down when I’m doing just that? I just wasted almost 2 hours for nothing. And I’ve paid for this app, super regretting it now if it’s going to give me these types of problems. Super angry, please update and fix your bugs! We really sorry about your problem. Actually, it seems a little bit weird. It should work fine. Can you please send an email mentioning your problem with "info.kitegames@gmail.com" Or you can also email us through our app from "Contact us" So that we can assist you. We will be happy to help you always. We see you're in trouble and we really don't find any problem in our end. Please send us an email at "info.kitegames@gmail.com" Or you can also email us through our app from "Contact us" so that we closely monitor your problem. Yes, you saw some review like yours but we hope you also see a ton of positive review. We're really sorry for your experience but we'll try to assist you in solving the issue. Just give us an email. Sorry for the inconvenience. Please follow the following steps to resolve your problem. 1. Please check your device storage and Keep your device storage free, as much as possible. 2. If possible, close all other apps while editing through our app. 3. Please don't lock the device or minimize the app or don't put the app in the background while using the app and don't put the app background for a long time. For further assistance, you can simply give us an email at "info.kitegames@gmail.com" Or you can also email us through our app from "Contact us". We will be happy to help you always.